Grace Qnique Metal Bobbin Case, Aluminum M Class, for Longarm Quilting Machines 14+15R 21" and Brother DQLT15"
High-grade aluminum bobbin case for the Qnique Quilter 14+ Quilting Machine. 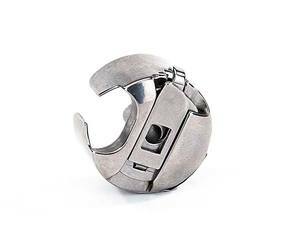 This bobbin case is made of a high-quality aluminum and is made to fit perfectly for the Qnique 14+ Mid-Arm Quilting Machine. It holds the large M-Class bobbin used by the Qnique.